You never really think about your keyboard when you’re using it. It either works, or it doesn’t, and you generally don’t give it much thought after that. I used to be part of the school of thought that said “$7 keyboards are all I need, thank you very much!” See, I’ve been using Apple keyboards for the better part of four years now. I like the chicklet keys, and they like me. I even went so far as to use an Apple keyboard on my Windows desktop. Sure, it was great for typing, but the flat and non-raised keys weren’t really appropriate for gaming. “There’s got to be a better way,” I thought out loud. 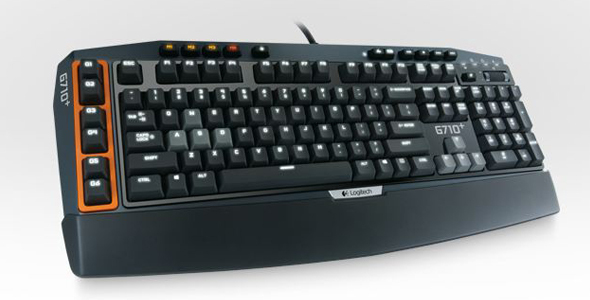 Then came Logitech’s G710+. And boy, is it a great keyboard. The overall look of the product is what you’d expect from Logitech’s design department. Nice angles on either side coupled with the orange, black, and white color scheme scream “Gaming,” yet refined enough that a non-gamer would still appreciate the aesthetics. Logitech’s flagship keyboard comes with all the bells and whistles you’d expect of a gaming keyboard, but there are a bunch of small touches that really make it stand out from the pack. Yeah, there’s backlighting, just like in any gaming keyboard made after 2004. But Logitech wired up dual zone lighting for the WASD keys, and the rest of the board, and each zone has four levels of brightness. However, you’ll want to keep the backlighting on at all times due to the fact that the printing on the keys is tricky to read without it. Also featured is a “game mode” setting, wherein after a button press, the keyboard’s Windows key, Caps Lock, and other context menu buttons are disabled, allowing you to keep playing your game without any accidental minimalizations to your desktop. There are also six “G- Keys”, which enable you to run a pre-set macro, or one of your own design. Married with the three Mode selections, you’re able to get 18 different macro settings, all of which can be controlled via the included software. I never saw a use for them in my time with the keyboard, but MMO and RTS players will find countless uses for these little miracle keys. Rounding out the specifications of the keyboard is the usual assortment of media control functions, a volume slider, and a lone USB 2.0 port that’s hidden in plain sight. Honestly, I’d have loved to see two USB 3.0 ports on this keyboard. And the fact you have to plug into two USB ports to use the thing isn’t exactly great for those of us low on USB ports. As a writer, I tend to fill a lot of my time with writing. Who would’ve thought, right? Naturally, I’m a pretty fast typer, and in using keyboards that have a low rollover rate, not all of my keystrokes are registered. The G710+ has a 26 key rollover, which basically means it’ll type faster than you can think. And using the keyboard is a dream, if a bit of an adjustment. Coming off of Apple’s chicklet keyboards, I found that I needed a few days of adjustment when using the mechanical keyboard. But once adjusted, I don’t think I can go back to a non-mechanical keyboard. That being said, you’ll most likely want to attach the inluded wrist rest; the keyboard is pretty tall, and can cause some pain on the wrists if not properly elevated. Actually typing on the thing feels great though, and isn’t as loud as you’d expect a mechanical keyboard to be thanks to some great sound dampening. At $150 MSRP, the G710+ is kind of a tough sell to folks who just want a good keyboard. But for those gamers that need the best performance out of every piece of hardware, look no further.